I recently re-read two of my favourite film books. The first was published in 1971, and I’ve read it maybe five times since then. The second was published twenty years later, in 1991, and I’d only read it once before, back in the early ’90s; I just read a reprint put out a few years ago. What I hadn’t realized until reading them both in close succession was just how much they share in common. Both deal with minor, half forgotten filmmakers with Germanic backgrounds from the ’20s and ’30s who worked in the horror genre; both have narrators who dig into those characters’ pasts and unearth secrets. And both play to the film-lover’s fascination with lost and forgotten movies, the thrill of discovery, and the possibility of risk in learning dangerous truths. In other words, they are both to some degree metaphysical mysteries built around our relationship to the movies. One of the great fantasies for anyone who loves movies is the discovery of a lost film, or the unearthing of a previously unknown and unsung filmmaker. Consider the excitement three years ago with the discovery of a nearly complete print of Fritz Lang’s Metropolis in Argentina, or the big stash of 75 previously lost films found last year in the New Zealand film archives, which contained a John Ford title (Upstream ), an early Hitchcock-scripted silent (The White Shadow [dir. 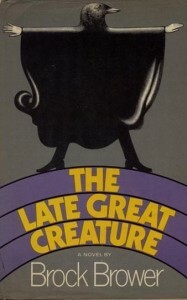 Graham Cutts, 1923]), and a lot of short comedies and documentaries. And in 2000, someone in England delivered to the British Film Institute a huge collection of over 800 silent nitrate “actuality” prints made during the first decade of the last century by Mitchell & Kenyon, a regional film company in Blackburn, a trove of fascinating social documents about life in Edwardian England. Just imagine finding a complete print of Erich von Stroheim’s Greed in a dusty attic, or a print of Welles’ original cut of The Magnificent Ambersons in a forgotten studio storeroom … it makes one’s mouth water. It’s not surprising then that this idea has attracted writers and filmmakers over the years. 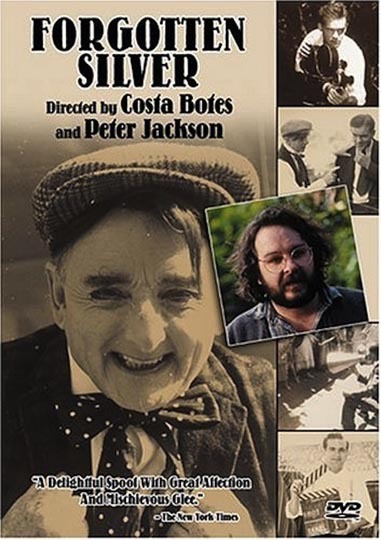 The last thing Peter Jackson did before setting out to refashion himself as a maker of bloated Hollywood epics was a faux documentary (co-directed with Costa Botes) for New Zealand television. 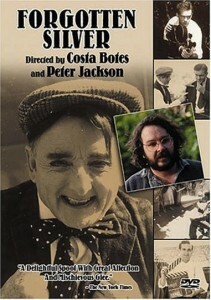 Forgotten Silver (1995) is a lovingly imagined, affectionate unearthing of a long-forgotten pioneer named Colin McKenzie whose films are rediscovered in a garden shed. Jackson and Botes create impressive excerpts of large-scale silent epics which supposedly prefigured every development of the medium long before the work of famous names we know from official film history. Some people were upset at being “tricked” by the film, but I prefer to see it as an expression of the romantic yearning to uncover lost treasures and to become an active participant in the rich history of the art form we all love. Interestingly, there seems to be a small sub-genre arising from this desire which for some reason, like the two books I’ve just re-read, focuses on horror – more specifically, disreputable, low-budget horror. In Cigarette Burns, his 2005 episode of Masters of Horror, John Carpenter follows a down-and-out movie theatre owner who’s hired by a rich collector (the incomparable Udo Kier) to track down a reputedly cursed movie called Le Fin Absolue du Monde; at its only known screening at the Sitges Festival, it supposedly drove the audience insane, resulting in an outbreak of bloody violence. 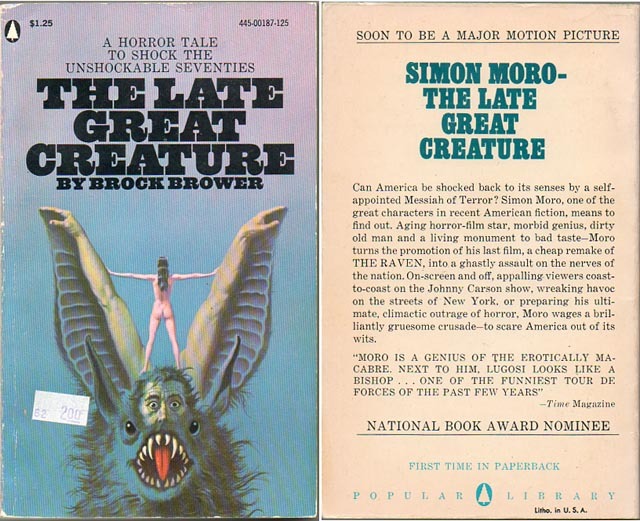 Brock Brower’s The Late Great Creature (1971) was nominated for a National Book Award, yet has seemingly always remained an obscurity. 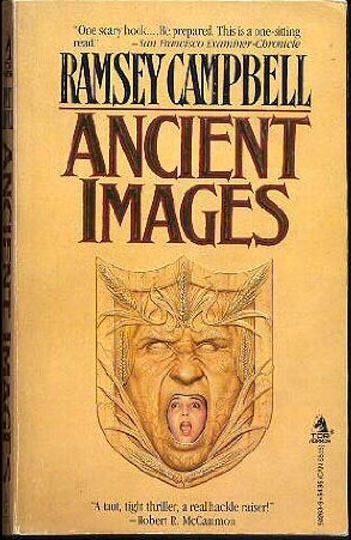 I got a hardcover copy from the Book of the Month Club back in ’71 and have re-read it a number of times over the years (most recently a used paperback), always with the same great pleasure I felt when I first encountered it. Narrated in three parts by three different voices, it tells the story of the great horror actor Simon Moro, an amalgam of Karloff, Lugosi, Lorre and others who defined the classic period of horror movies, but who is darker and more disturbing than any of them. The first section (epigraph: “A clown isn’t funny in the moonlight.” Lon Chaney) consists of the research notes of magazine writer Warner Williams who has travelled to California to write a piece on Moro for Esquire as the ageing actor works on a cheap Poe “adaptation” called The Raven being directed by Terry Cowan, a cheerful hack obviously modeled on Roger Corman (though Corman of course, at his best, was much more than a hack). The film costars Quincy Adams (a touch of Vincent Price) and Hazel Rio (the name obviously suggests Hazel Court, voluptuous star of several Hammer horrors and two of Corman’s Poe pictures). This section of the novel is steeped in a richly detailed history of ’30s horror, into which Brower weaves the story of Moro and his greatest creation, Ghoulgantua, a Frankenstein-like monster brought into the contemporary world to overthrow middle class complacency. Moro’s career, like Lugosi’s, went into early decline and he ended up in a series of Gila Man movies. 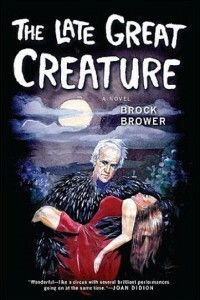 Brower perfectly captures the sense of precariousness which plagued so many careers in Hollywood, and introduces elements of mystery surrounding a movie Moro made in Germany just after the war (shades of Peter Lorre’s Der Verlorene ), a film so disturbing that it was suppressed by the authorities. 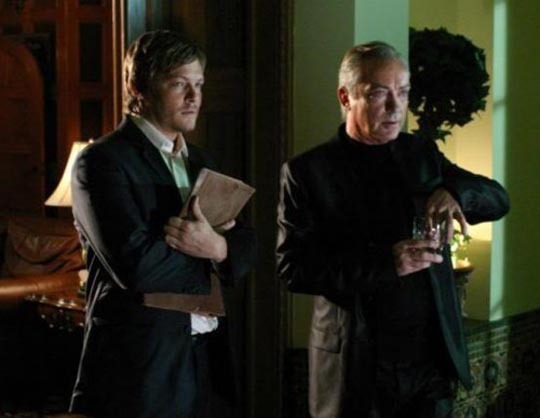 The second section of the novel is narrated by Terry himself as he gears up for a big promotional stunt for The Raven in New York. Moro gave him a lot of trouble during the shoot, trying to push the production into darker areas, “ruining” takes by injecting disturbing bits of business into shots. Now the nervous director is having trouble keeping control of Moro as he makes public appearances (an hilariously gruesome talk-show moment in particular) leading up to the premiere. Finally, we get Simon Moro’s own memoir (epigraph: “Better to end in horror than a horror without end.” Adolph Hitler), written on the eve of the premiere screening, covering his early years (not in Vienna, Austria, as it turns out, but rather in Vienna, New Jersey) and his career in Hollywood, his desire to reflect in his films what he saw as the true horrors of life (Christmas and rampant consumerism among them). His view of the world is so dark that it gives him pain to see the majority sleep-walking through life; he wants to shock them awake. The novel ends with the culmination of that aim, a promotional stunt which produces a horror far beyond the abilities of Terry Cowan and his movie. 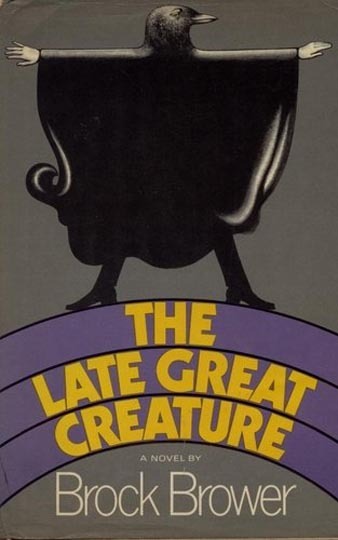 The Late Great Creature is a richly imagined piece of alternate film history, genuinely disturbing but also terrifically funny. Brower is a sophisticated writer with an obviously deep knowledge of film history and criticism and an awareness of the ways in which movies penetrate deeply into our private and social lives. I’m happy to see that the novel is being republished by Overlook Press (though with a really heinous cover design). 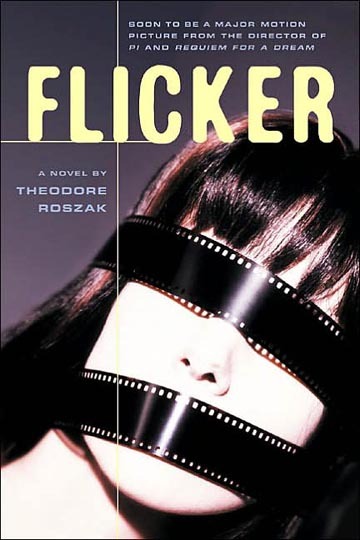 Re-reading Theodore Roszak’s Flicker so soon after The Late Great Creature, I have to think that Roszak had more than a passing familiarity with the earlier book. Although he writes on a much larger scale and this dense novel is nowhere near as playful as Brower’s, there are many similarities. Jonathan sets out to learn what he can about the director Max Castle, who began at UFA in the early ’20s, was lured to Hollywood where his strange obsessions made the studios turn against him, and ended his career making cheap horror movies at poverty row studios for increasingly small budgets while trying to raise money for his own ambitious projects, before finally dying early in World War Two. Jonathan tracks down as many of Castle’s films as he can find, initiating a critical campaign to establish a more serious reputation for the director (something like the eventual rehabilitation of Edgar Ulmer as “king of the Bs”). But the more of Castle’s work that he discovers and views, the deeper his obsession becomes and his personality undergoes subtle and increasingly disturbing changes. He also gradually uncovers peculiarities in Castle’s life story, particularly concerning the religious order which ran the orphanage where Max grew up and which apparently had enormous power over him. It’s here that Flicker reveals itself to be a large metaphysical mystery in the Umberto Eco mold, as it traces the origins of the movies back to a medieval heresy and beyond, opening up a kind of cosmic chasm beneath the surface of everyday life, a Lovecraftian abyss into which Castle’s films offer subliminal glimpses. The machinery of filmmaking, it turns out, with its rapid, rhythmic opening and closing of the shutter, physically embodies a bleak Manichean view of existence, reiterating the timeless conflict between the two gods of light and darkness in a way which reaches into the brain not merely on a subliminal level, but more deeply on a neural level, and instills this philosophy in the minds of unwary audiences, accelerating our rush into nihilism. The movies, their origins, their seductive power, eventually consume Jonathan’s life, culminating in an apocalyptic vision of the world’s end. But along the way, the book is dense with film history and theory (including some very funny satire on the more extreme forms of academic pretension, particularly among the French), and – like Brower’s novel – it evokes the attraction that movies possess even when they seem at their most decadent and unhealthy (in fact, for some of us that’s when they’re at their most attractive!). I’ve read comments that suggest Flicker is marred by moralizing, and it’s true that the narrator has a tendency to throw out judgemental opinions about films which lie outside his own narrow niche interests; but this is just a part of the game Roszak is playing, using the intellectual limitations of his protagonist in the construction of a vast “what if” edifice to explain the powerful, undeniably hypnotic hold the movies have on us. This is a novel after all, not a treatise, and he follows the logic of his conception to its farthest limits. 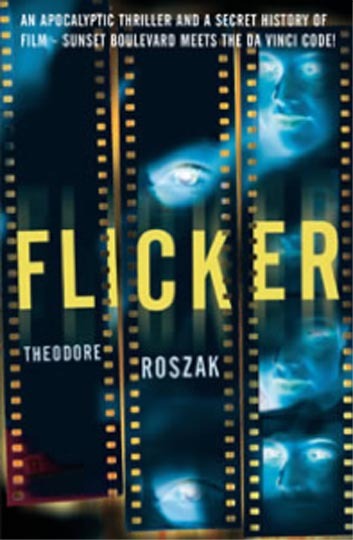 Roszak’s book is the literary equivalent of a good paranoid conspiracy thriller and his cosmogony, for all its wildly improbable invention, actually offers a very satisfying “explanation” for the power of cinema. This entry was posted in Commentary, Review and tagged Fiction, Film Criticism, Film History, Horror. Bookmark the permalink. I have been reading your blog since last October. I have to apologize for not responding to your blog earlier. I have to say that I was initially surprised that you have seen so many horror films. I always thought of myself as a horror film fan. My earliest film viewing memories are of watching Chiller Thriller Theatre and all the old Universal Horror from the 1930’s. In fact, it was all these films, plus the 1950’s giant insect films and later Hammer films, that initially got me interested in filmmaking. I came from the ‘I could do a better job of making that film’ school of thought. I was probably more inspired by the bad films than by the good ones. I read about many of these films years before ever seeing them, in the pages of Famous Monsters of Filmland and Cinefantastique or books like Denis Gifford’s A Pictorial History of Horror Movies, or David Pirie’s A Heritage of Horror. Thanks to your blog, I have been introduced to several horror films that I was completely unaware of previously. Films like Battle Royale, Cannibal Holocaust, Rec, Santre Sangre, to name a few. Or films that I had wanted to see for years, but hadn’t until recently, Michael Reeves’ Sorcerers, or Hammer’s Vampire Circus. One such film, Hammer’s Captain Kronos, had for years only been known to me from reading a ‘novelization’ of the film. When I was a teenager, I attempted to use this ‘novel’ to create a script to make the film myself with my school friends. Even though I was frantically making crossbows and swords in shops classes, I never got beyond shooting about one third of that film. Too many locations, and too large a cast were the downfall of that early production. I did however, finally see the original Hammer version years later. Now, in your current blog, “Lost and Found,” you write about two books, Ancient Images, and The Late Great Creature, which sound fascinating. Unfortunately, Amazon.ca lists most of the books you mention as ‘not yet released.” I did happen to find, Ramsey Campbell’s The Grin of the Dark and I am currently reading it on Kobo. 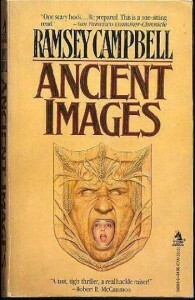 While I was aware of Campbell, the only other novel that I had read by him was, The Face That Must Die. Keep blogging, George. I am certain that there are many readers of your blog, like myself, who look forward to your blog every week. Thanks for the positive feedback. It’s always nice to get confirmation that someone out there is reading my posts! Your background sounds much like mine — although somehow I never got into trying to make my own movies that early; I guess I just didn’t have the right peer group in small-town Newfoundland! I was already writing ambitious SF and fantasy scripts in my teens, though. Gifford and Pirie, among others, were big influences on my taste, and Cinefantastique was a hugely important source of information back in the ’70s. Of all the things that have disappeared over the years, my collection of Famous Monsters issues is one of the most sorely missed. As for Brower’s Late Great Creature, Chapters lists its Canadian release as October 4, so you should be able to get a copy soon. True, these all reference lost, mythic or fictional texts and films, but not in quite the same way as the three books I write about here. They belong more to a broader literary tradition of textual play … even the titular movie of David Foster Wallace’s magnum opus serves a more metaphorical (and satirical) purpose, representing our society’s descent into a state of perpetual distraction. The three books I cite focus much more closely on our emotional and psychological relationship with cinema.